Picture Right to Left: Minister for Defence Marise Payne; Chris Sievers - Chief Executive Officer (and owner) Air Affairs; Mrs. Ann Sudmalis MP - Parliament of Australia (local member for Gilmore, New South Wales); Jared Ethier - Kratos UAS Business Development Account Manager; Ryan Brown - Kratos Australia lead engineer. Kratos Defense & Security Solutions has opened a new facility in NSW, which will be the centre of its emerging Australian defence business. The new office is located at the Albatross Aviation Technology Park in Nowra, near the Naval Air Station HMAS Albatross. Kratos said it is initially focused on unmanned aerial system (UAS) tactical/target and range support system opportunities, but has identified opportunities in the country for each of its five divisions. 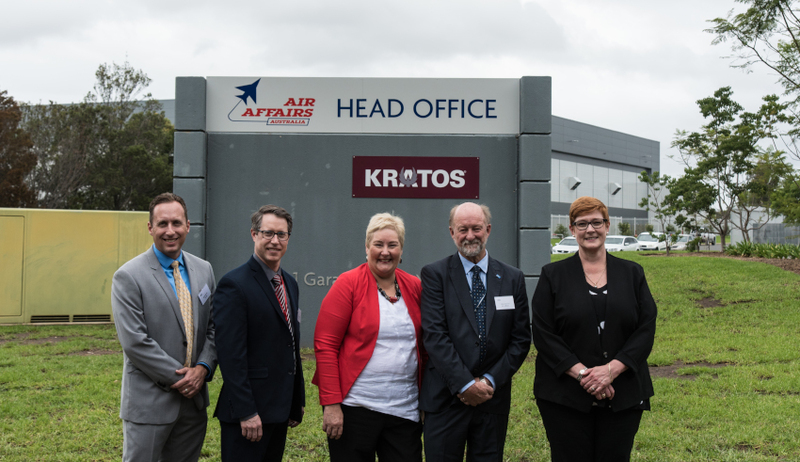 Kratos celebrated its office opening along with team partner Air Affairs, an opening that was attended by Australian Defence Minister Marise Payne, who said aerial target systems are intergral to ADF training. “Using aerial target systems enables the ADF to undertake specialised training effectively and efficiently, using realistic scenarios that ensure our personnel have the skills needed to respond to any threats," Minister Payne said. Steve Fendley, Kratos’ unmanned systems division president, said the company's products would offer Australia interoperability with the US. “Kratos is committed to supporting the ADF needs with our range of tactical and target UAS primarily designed for the US DoD with direct applicability to the ADF missions and systems, many of which are common to both countries," Fendley said. "With the increased defense focus in Australia, and the low cost v performance ratio our UAS provide, we offer true leading technology, capabilities, and performance all at an affordable cost; directly applicable to the ADF objectives." Kratos is currently under contract on multiple high-performance jet-powered tactical unmanned aerial drone systems.